Please call owner Steven at 530-541-5882 or e-mail tahoezig@yahoo.com . Boat Location: Rio Vista, California. 1989 Sea Ray Convertible, 3208TA Cat 1500 hrs, Westerbeke 11KW Genset, Magnum Energy 2800W inverter 2018, Full canvas and exterior paint 2014, updated interior flooring/upholstery and wall treatment, central vacuum system, full entertainment center, built in appliances, microwave, Sub Zero refer and freezer, ice maker, two staterooms, full bath with shower and vacuflush toilet, two helms fly bridge and cockpit back down, engine synchronizer, auto pilot, 24 mile radar, 2 GPS, marine air horn, Union Pacific train air horn, 10' RIB dingy with 9.9 Merc OB, 600 electric davit, windless with 300' chain rode. 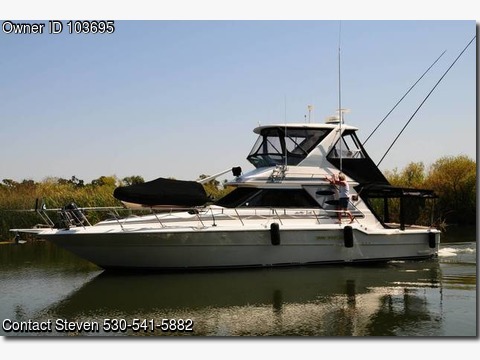 This boat has been professionally maintained in the Sacramento Delta fresh water for the past 13 years. She is in excellent mechanical condition.